British filmmaker Carol Morley brings her subterranean filmmaking approach to this loose adaptation of Martin Amis' existential detective novel Night Train. And while the film has the groove of a noir whodunit, it's actually a head-trip into the nature of life itself. It's also simply gorgeous. Like a David Lynch movie, it's evocative, insinuating and often befuddling. And it skilfully worms its way under the skin. 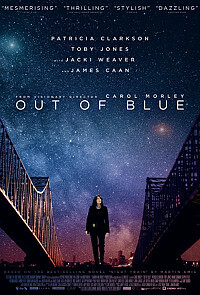 In New Orleans, Mike (Clarkson) is a jaded detective investigating the bizarre murder of astrophysicist Jennifer (Gummer). The two strongest suspects are Jennifer's boss Ian (Jones) and her professor boyfriend Duncan (Majors), but neither explanation quite adds up. Her parents (Caan and Weaver) also seem rather shifty, as do her twin brothers (Brad and Todd Mann). but all are genuinely grieving her loss. And while working with two colleagues (Tveit and Ross), Mike is also finding that this case is triggering suppressed memories of her own childhood. While the plot is presented as a rather formulaic procedural mystery, there are subtle clues that this isn't your usual thriller. The central case is not so much about who killed Jennifer as why, but it's also much more about why this is causing Mike to experience waves of memory along with the occasional blackout. All of this is linked to a decades-cold case involving a serial killer, but even that isn't quite what it seems. And hearing Jennifer and Duncan speak about the nature of the universe gives the whole film a magical, philosophical swirl. With her gravelly voice in full flow, Clarkson nicely underplays Mike as a thoughtful, detail-oriented cop who feels that her entire life has been about homicide. Watching her obsess over the tiniest morsel of information is fascinating, not for what it says about the murder but because it continually reveals the search going in inside her. And the cast is packed with terrific supporting players, from thrilling veterans Caan and Weaver to effectively subtle turns from Majors and Ross. Some elements here don't quite work, including a bizarrely rendered event in outer space. And the plot seems to become unstuck in time in the final act, something that might have been tightened in the edit. But this is an involving film that restlessly jars the audience with its introspective approach. The big mystery may feel oddly predictable, but Morley is actually taking the audience on a journey into their souls, opening long-locked doors and pulling us out from the shadows.